We will have an onsite community stitching day (April 7th) and an installation day (May 11th). These events are organized by Philly Knits but membership is not required. All individuals and groups are welcome to participate. For more information about Philly knits or specifics about these projects contact Lynne Landes of Philly Knits at lynnlandes@gmail.com . Please join us as we prepare to yarn bomb Awbury Arboretum’s Secret Garden! We will be creating yarn “flowers”, granny squares and simple bands to wrap tree trunks and structures in AdventureWoods. All items made will be joined together to create a Secret Garden “Fiber Fantasy” in May. Knitters and crocheters of all skill levels are welcome! Yarn and limited tools will be provided, please bring hooks and needles (medium – jumbo size). We will be meeting on site at the Francis Cope House. This event is fully registered. 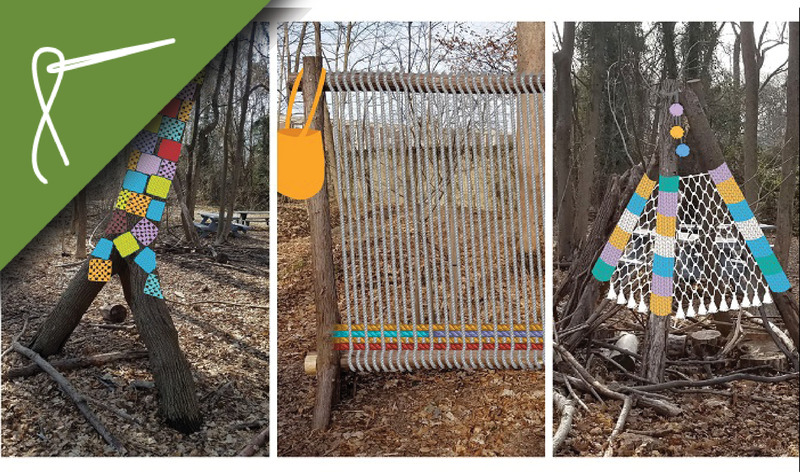 Help us create a Secret Garden “Fiber Fantasy” as we yarn bomb the Awbury Arboretum! We will be decorating the gate and the various structures in AdventureWoods with objects knitted and crocheted by the community. Please bring your hooks and needles (medium – jumbo size), yarn/tapestry needles and scissors. Clothing and footwear appropriate for the outdoors is recommended, as trails may be muddy. We will be meeting at the gate of the Secret Garden. This event is FREE. Click here to register. This event is part of Awbury’s ongoing series celebrating Natural Fibers. Would you like to begin receiving our weekly email newsletter? From us to your inbox.